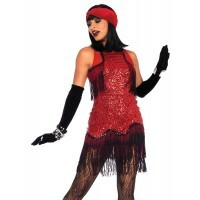 Fun Charleston Charmer Flapper costume has a fringed dress with sparkly gold sequins. Kick up your heels in this fun Flapper costume. It has a cascade sequin zipper back dress with flirty fringe trim at hem and neckline and the matching sequin headband with jewel detail. Item Number: LA-c85543 | Approximate Size (Inches): 10.00 wide x 3.00 deep x 14.00 high | Approximate Shipping Weight: 2.00 lbs. These 3 inch flared heel black vegan leather pumps have a T-strap front and perforated det..